Virginia Launches New Web Site to Quiz Travel "Personality"
Interactive Web site matches visitors' personal passions with customized travel experiences. This new Web site engages travelers in a brand-new way and allows them to live out their travel passions in Virginia. It's exciting for a tourism promotion to use cutting-edge technology that allows us to get personal with our visitors. The Virginia Tourism Corporation today launched the "Passionality" travel Web site, enticing travelers to achieve a richer, more passionate existence. The site at http://www.Virginia.org/passionality uses the latest technology to help travelers discover their true inner personalities, defined by their personal passions for wine, music, heritage, outdoor adventure and other fulfilling travel experiences in Virginia. On the new Passionality site, visitors dive deep into who they really are, to discover their own unique passionate personalities - their passionality. The site then matches the best experiences in Virginia with the visitor's passionality. Rather than just provide a listing of travel ideas, the Web site is designed to showcase Virginia's experiences, including more features and products that allow visitors to reconnect with their sense of self and what's important to them and their families. "Virginia is for Lovers is about a passion for travel and a dedication to living life to its fullest," said Alisa Bailey, president and CEO of the Virginia Tourism Corporation. "This new Web site engages travelers in a brand-new way and allows them to live out their travel passions in Virginia. It's exciting for a tourism promotion to use cutting-edge technology that allows us to get personal with our visitors." A virtual hostess guides visitors to their passionality, choosing icons representing music, wine, history, outdoor adventure and others that determine their passionality. The site features 12 distinct passionalities - from Ecothusiast to Uber Rebel to Adrenaline Junkie and Front Row Fanatic, and gives visitors a greater sense of self and in-depth travel planning ideas. Customized trip getaway ideas, sample itineraries and Virginia treasures yet to be discovered are highlighted to match each passionality. Each passionality is represented by a distinctive icon that brings the traits of that passionality to life. Visitors can order T-shirts emblazoned with their passionality icon. Visitors looking for more travel ideas can find them in Virginia's Portraits of Passion, also on http://www.Virginia.org. The portraits are compelling video vignettes of some of Virginia's most passionate citizens - chefs, innkeepers, wine makers, musicians and other tourism partners who are living their passions on a daily basis and want to share them with travelers. Virginia is for Lovers - Live Passionately is the newest travel marketing campaign from the Virginia Tourism Corporation, targeting the hearts and interests of today's travelers. The campaign entices savvy travelers to visit Virginia to live out their passions for wine, music, heritage, outdoor adventure and other enriching experiences that make Virginia one of the top destinations in the country. Virginia is for Lovers, created in 1969, is one of the most loved and well-recognized tourism slogans in the world. The Live Passionately campaign showcases the famous Virginia is for Lovers brand and makes it more relevant to today's travelers. Everyone has a passion, yours has a name. 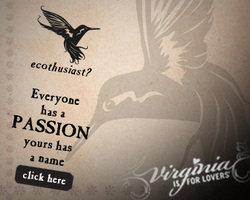 Visit http://www.Virginia.org to discover your "Passionality" and start planning a trip to Virginia. Travel information also is available by calling 1-800-VISITVA.